On episode 584 of this podcast, I spoke with Marcus Whitney, the Nashville-based investor, entrepreneur, and president of Briovation. We discussed blockchain projects and emerging developments in health technology. Briovation is focused on analyzing, investing in, and providing open-source blockchain technology to healthcare companies nationwide to nurture innovation and create unity within the space. The Tokenizing Health announcement also included the public launch of Solaster, Briovation’s first health blockchain invention. On today’s tech podcast, I wanted to find a unique way of exploring the impacts blockchain is having on healthcare. Solaster is now a leading healthcare-focused blockchain company is developing the world’s first interoperability health data standard for Dapps and smart contracts. As a solution to address the progression of fragmented development efforts, Solaster introduces GO-70, the world’s first interoperability healthcare data standard for decentralized applications. Built on GoChain, a 100% Ethereum-compatible blockchain which is 100x faster, more distributed and greener than Ethereum, the GO-70 standard will allow application developers to build the global healthcare network of the future, offering true interoperability for both patients and providers. However, rather than just hear about another solution from the CEO and founder, I also invited one of their partners on the show to learn how it’s actually solving real problems. 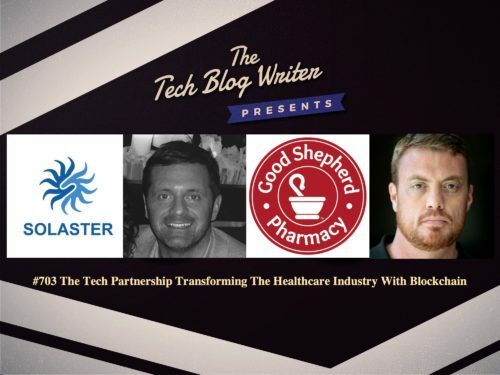 Good Shepherd Pharmacy and Solaster Health are partnering to bring Good Shepherd’s novel pricing transparency and monthly membership platform to the blockchain. Good Shepherd has served the underinsured marketplace since its inception in 2013 and already has over 1,000 active members. Its model is simple: in exchange for a fixed monthly membership fee, Good Shepherd members have access to medications at little to no cost with no markup. Solaster Health is a blockchain development platform focused on interoperability for healthcare decentralized applications. And Good Shepherd is a nonprofit membership pharmacy for the uninsured. But what opportunities will this bring to both parties?